Whether you’re creating brand new listings, or you want to improve upon existing ones, there are several key steps you can take to optimize your listings and increase sales. My agency, Kobel Consulting, helps both first time clients who are starting from scratch, as well as those with established accounts who want to give their sales a boost. This post details what we’ve learned about listing optimization and how you can give your listings the edge they need to stay ahead of your competition. When it comes to the Amazon algorithm, your title is the most heavily weighted part of your listing, so it’s important to include as many keywords as possible that you’re trying to rank for. Just make sure that your title still makes sense and sounds appealing. Different categories have different character requirements, so be sure to use the maximum number of characters allowed for your category. The second most heavily weighted part of your listing is your bullet points. This is where you’ll include your longer phrase keywords that maybe didn’t make sense to use in your title. It’s important to include those in your bullet points because Amazon will see them and start ranking you on those keywords as well. The format I like to use is the first few words in all caps to grab the customer’s attention and let them know the key benefits of the product. Amazon allows up to 5 bullet points, and I highly recommend utilizing them all. The next most important item when optimizing your listings is your images. I always say that 5 should be your minimum, but try to include as many images as you can. They are a great way for you to showcase your product and demonstrate the different uses and applications. Highlighting your product’s use in real life scenarios is always a great idea because it helps customers to picture themselves using it and can help them to identify better with what you’re selling. Next is your product description. When writing your product description, be sure to use HTML tags. This allows you to create spacing, boldness and headlines within your product description. The program I use is called draftin.com. Simply enter your text into the program and it returns it to you in HTML format so all you need to do is copy and paste it into your Amazon listing. Easy peasy. And it’s free! Lastly, you’ll want to make sure you take advantage of the backend keywords. These are words that didn’t make sense to use in your actual listing but that are still relevant to your product. Examples could be misspellings of your brand or some other common keywords, ingredients, or competitor names or keywords. Currently, Amazon allows you to use 249 characters or less, so be sure to utilize every last one of those characters. 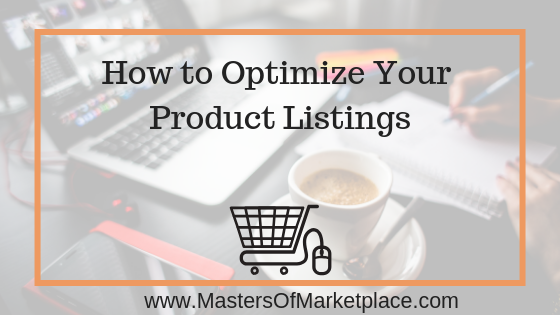 When creating or optimizing your listings, one of my pro optimization tips is to find and analyze your top 3 competitors on Amazon. Read through their reviews, especially the negative ones, because they’ll show you what customers are complaining about. Then you can take those complaints and turn them into something positive that you can highlight about your own product.